English to Tibetan Translation for tattoos and tee shirts are becoming more and more popular. Tibet and all things Tibetan have become very popular in the last couple of years. The Dalai Lama is now a household name. This year the hottest and top selling easy to make gifts for men, women and kids alike are Tibetan Name Tee shirts! The above tees say John, Mary and Shedhe (peace) in the Tibetan script. If you would like your own name translated or the name of Mom, Dad or a good friend as a gift or even as a gag, please write to me here! After your name is translated, you can then choose whichever type and color of tee shirt you would like! Looking for a silly or humorous gift idea for a coworker, neighbors or friends? Sure to be one of the top ten favorite, cheap and cool gifts for guys or girls this year is the O-Bam-A t-shirt. Need a last minute, inexpensive gift for your husband, boyfriend, wife or girlfriend? 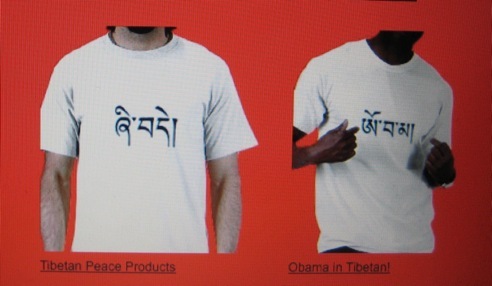 How about a 'Tashi Delek' (Hello) or 'Om Mani Padme Hum' shirt. Even coworkers, parents and teens alike will like these creative items! You can get a shirt for your baby, teenagers and even your dog! Take a look in the Tibetan Life online store below for one of the gifts giving catalogs.